While the world chose to turn a blind eye, the biggest story of 2013 is the methane over the Arctic. As the year progressed, huge quantities of methane started to be released from the seabed of the Arctic Ocean. Very high concentrations of methane have been recorded over the Arctic Ocean over the year and the high releases are still continuing (a peak of 2399 ppb was reached on December 29, 2013, p.m.). The methane appears to originate particularly from areas along the Gakkel Ridge fault line that continues as the Laptev Sea Ridge, as discussed in earlier posts. The Naval Research Laboratory animation below shows that sea ice extent is growing and that thinner sea ice is getting thicker, which is normal for this time of year. At the same time, the multi-meters thick ice is not increasing in extent nor in thickness. In fact, much multi-meters thick sea ice is being pushed out of the Arctic Ocean. Methane looks to be moving underneath the sea ice along exit currents and entering the atmosphere at the edges of the sea ice, where the sea ice is fractured or thin enough to allow methane to rise. 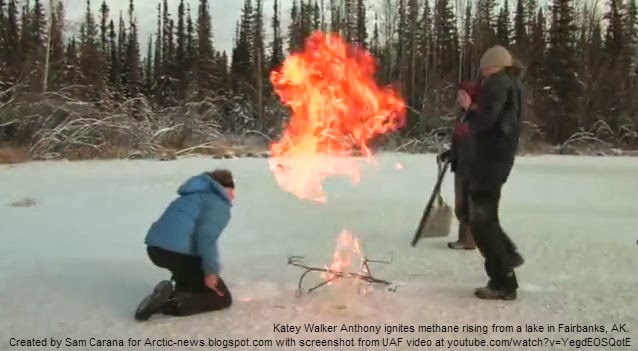 What is causing the release of this much methane? To answer this question, let's first examine why the Arctic is warming up more rapidly than other places. Emissions are causing albedo changes in the Arctic, while emissions from North America are - due to the Coriolis effect - moving over areas off the North American coast in the path of the Gulf Stream (see animation on the right). These impacts constitute a second kind of warming that is hitting the Arctic particularly hard, on top of global warming. Snow and ice decline is causing more sunlight to be absorbed in the Arctic (feedback #1). As warming in the Arctic accelerates, a weaker Jet Stream lets warmer air move from lower latitudes into the Arctic (feedback #10). A weaker Jet Stream further elevates the chance of heat waves warming up the Gulf Stream and warming up rivers that end in the Arctic Ocean (feedback #11). This feedback looks to have caused a lot of seabed warming and subsequent methane releases from the sea floor of the Arctic Ocean. The high methane concentrations are in turn further warming up the air over the Arctic (feedback #2). The above is depicted in the diagram below. 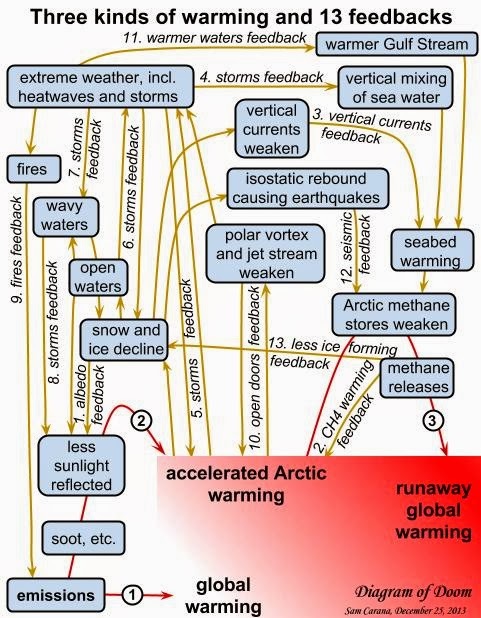 The diagram below shows thirteen feedbacks that are accelerating warming in the Arctic. 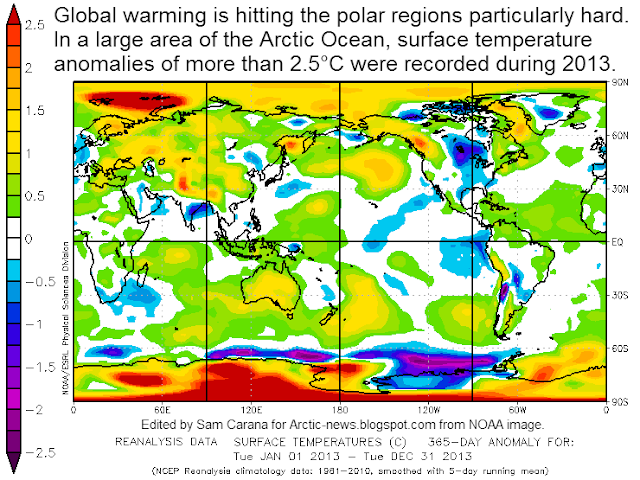 The image below shows that global warming is hitting the polar regions particularly hard. In a large area of the Arctic Ocean, surface temperature anomalies of more than 2.5 degrees Celsius were recorded during the year 2013. Importantly, on specific days anomalies did reach much higher values. The image below shows how a large area of the Arctic was exposed to 20+ degrees Celsius surface temperature anomalies recently. The NOAA map below shows where sea surface temperatures in August 2013 were warmer (red) or cooler (blue) than the 1982-2006 average. By September 2013, surface waters around the Barents Sea Opening were about 5°F (3°C) warmer than they were in 2012. Southern Barents Sea temperatures reached 52°F (11°C), which is 9°F (5°C) warmer than the 1977-2006 average. 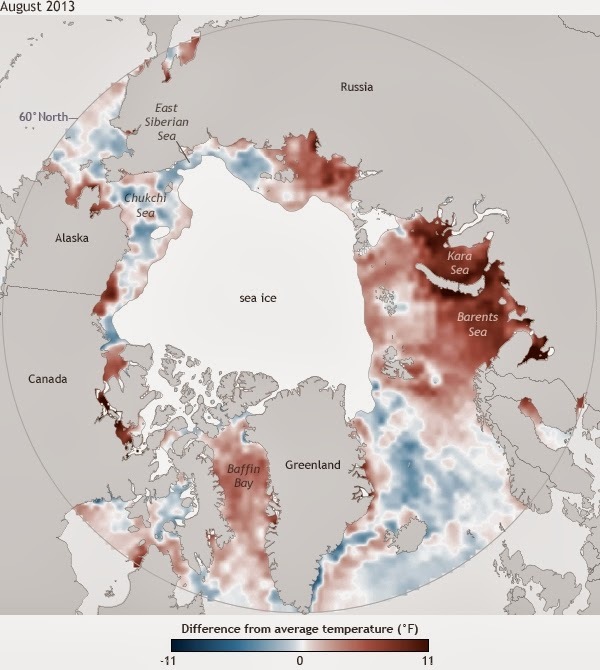 Warm water from rivers flowing into the Arctic Ocean was highlighted in the earlier post Arctic Ocean is turning red. The danger is that an ever warmer seabed will result in release of ever larger quantities of methane, escalating into runaway global warming. What makes this story even bigger is that the media have largely chosen to ignore the threat that methane releases from the Arctic Ocean will escalate into to runaway global warming. While one can read many stories in the media that global warming was supposed to somehow have 'halted', little attention was given to a recent study that points out that the commonly-used United Kingdom temperature record is actually biased and underestimates warming in certain regions, in particular the Arctic. And while the IPCC points out that most of the additional heat associated with global warming goes into oceans (image right), the IPCC fails to highlight the vulnerability of the Arctic Ocean. Indeed, perhaps the biggest story of the year is the question why the IPCC has decided not to warn people about the looming Arctic methane threat, ignoring the need for comprehensive and effective action such as discussed at the Climate Plan Blog. Extreme weather causing fires, etc." title="extreme weather causing fires, etc. 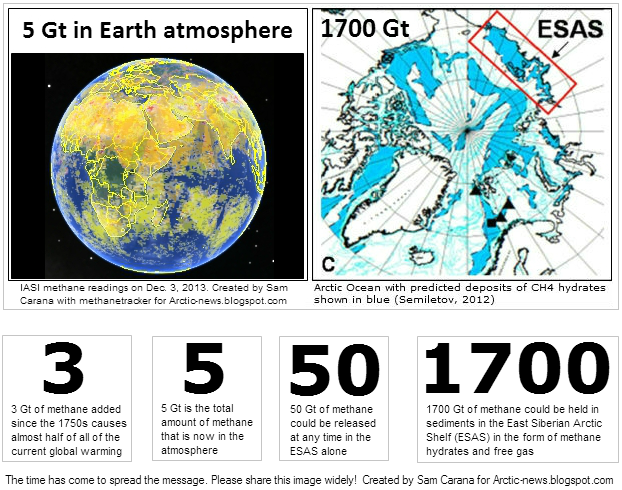 Above image shows that Earth's highest atmospheric methane concentrations are recorded over the Arctic Ocean. The insets show lower methane concentrations over various continents, North and South America (top left), Europe (mid right), Australia bottom left) and Antarctica (bottom right). The top right inset shows sea ice thickness, illustrating that methane is escaping from the sea floor of the Arctic Ocean and is transported by currents to the thinner edges of the sea ice, where it is entering the atmosphere. 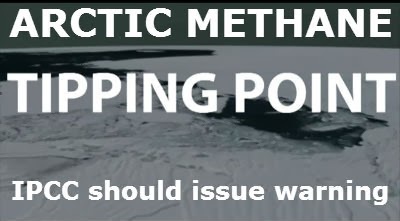 As discussed in a recent post, methane can be bubbling up in the Arctic Ocean with a force strong enough to prevent sea ice from forming in the area. This feedback is depicted in the Diagram of Doom further below as feedback #13. Around this time of year, Arctic sea ice is typically growing rapidly, both in extent and thickness. However, the above image shows that in the area marked by the white circle, between Svalbard and Greenland, the sea ice is actually in decline. This decline is caused by methane that is entering the atmosphere in the area as warmer water continues to be transported by the Gulf Stream into the Arctic Ocean, as discussed in previous posts such as this one, and as also illustrated by the image on the right. 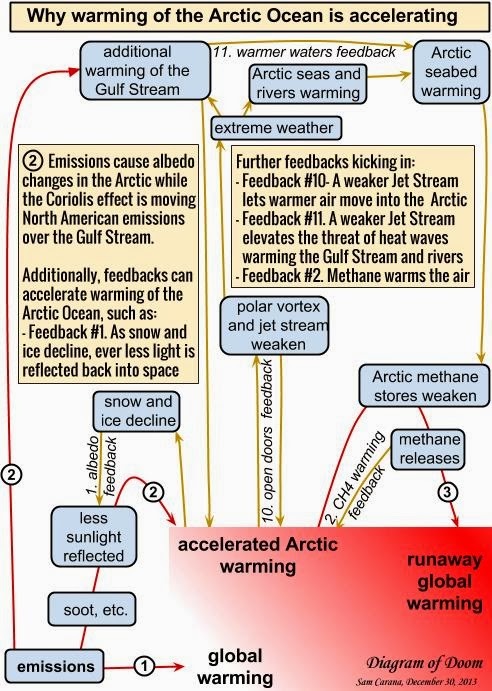 Warmer than average waters have been entering the Arctic Ocean along the Gulf Stream since July 2013, when changes to the Jet Stream contributed to waters off the North American coast reaching record warmest temperatures, as depicted in the Diagram of Doom below as feedback #11. In summary, the above images show that methane makes it hard for ice to form, while the warm water of the West Spitzbergen Current is pushing the ice away, breaking up even the thickest ice to the north of Greenland. Surface temperatures in the area have been extremely high recently. 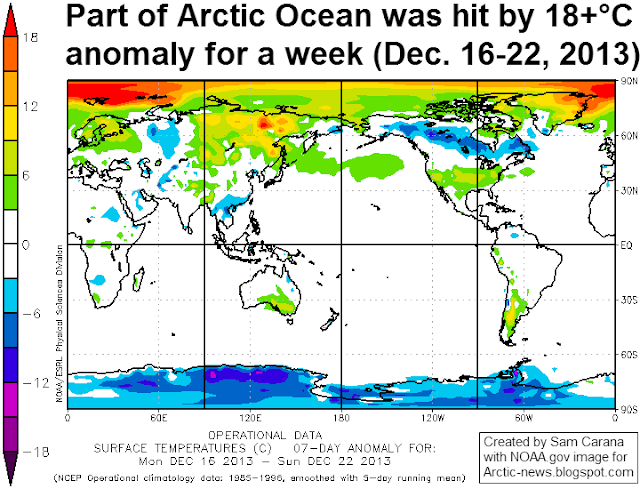 This part of the Arctic Ocean was hit by an 18+°C anomaly during the week from December 16 to December 22, 2013, as illustrated by the image below. On some days that week, anomalies of 20+°C were recorded over an even larger part of the Arctic Ocean, as described in a previous post. 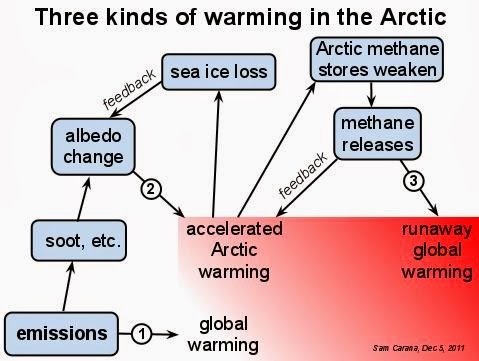 These anomalies show how a number of feedbacks can interact and contribute to huge warming peaks in the Arctic Ocean, such as methane releases (feedbacks #2 and #13 in the diagram below) and changes to the Jet Stream (feedbacks #10 and #11 in the diagram below). This spells bad news for the sea ice. Some people may have hoped that the thicker sea ice north of Greenland would take decades to disappear. However, as depicted in the Diagram of Doom below, feedbacks can hugely accelerate sea ice decline. As sea ice declines further, more open water make it more likely that stronger storms and cyclones will appear that can rip the sea ice apart and move the pieces into the Atlantic Ocean in a matter of days. The image below, by Jim Pettit, illustrates the ongoing decline of the sea ice. 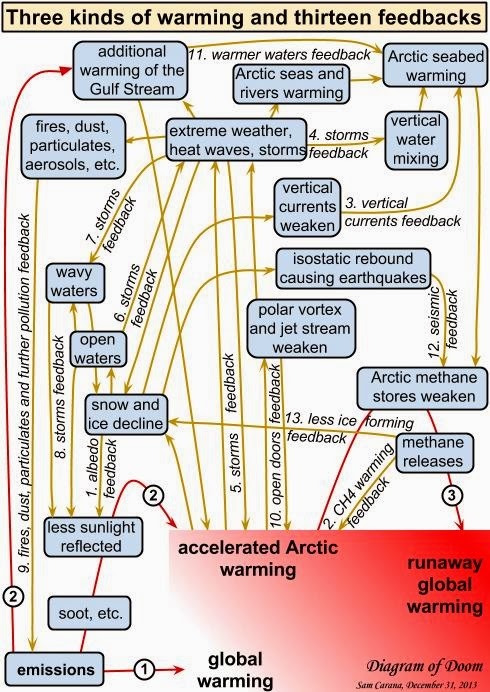 Thirteen feedbacks that can accelerate warming in the Arctic are depicted in the diagram below. - How Do We Act in the Face of Climate Chaos? 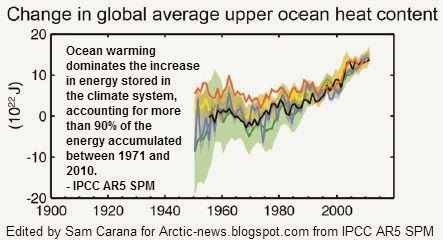 - The astounding global warming impact on our oceans . . .
Feedbacks are pictured in a more general way in the image below. 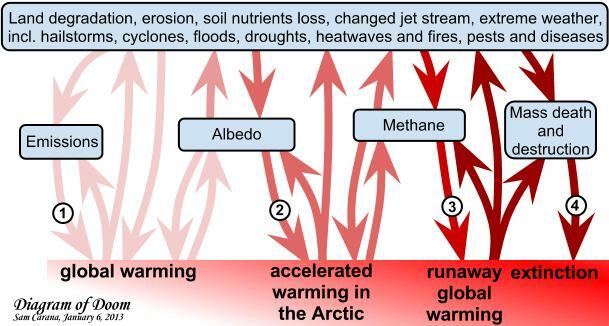 Above image shows how the accumulation of the many feedbacks and their interaction leads to ever stronger albedo changes, while the resulting accelerated warming in the Arctic causes increasing quantities of methane to be released from the seafloor of the Arctic Ocean, in turn leading to runaway global warming, as also pictured in the image below. 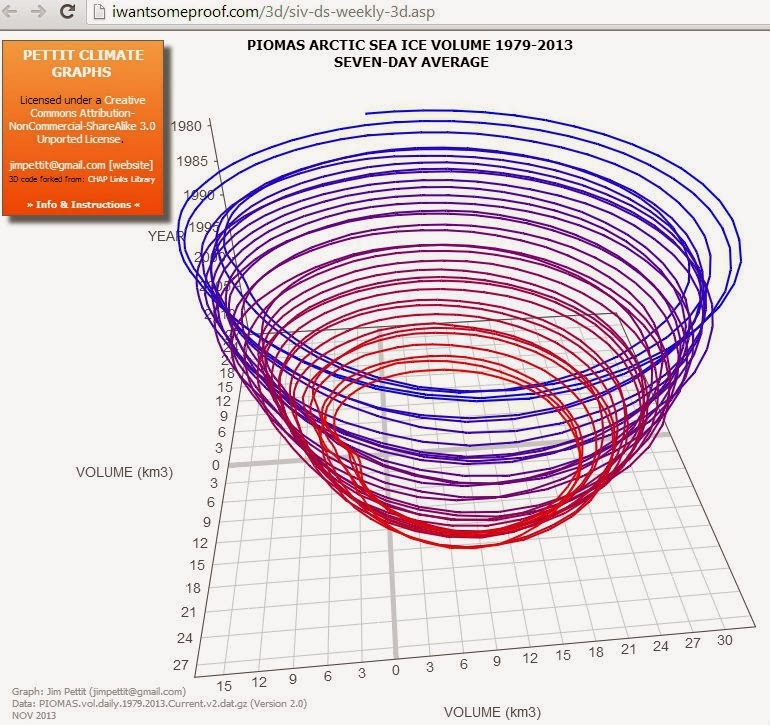 As above image shows, a polynomial trendline already points at global temperature anomalies of 5°C by 2060. 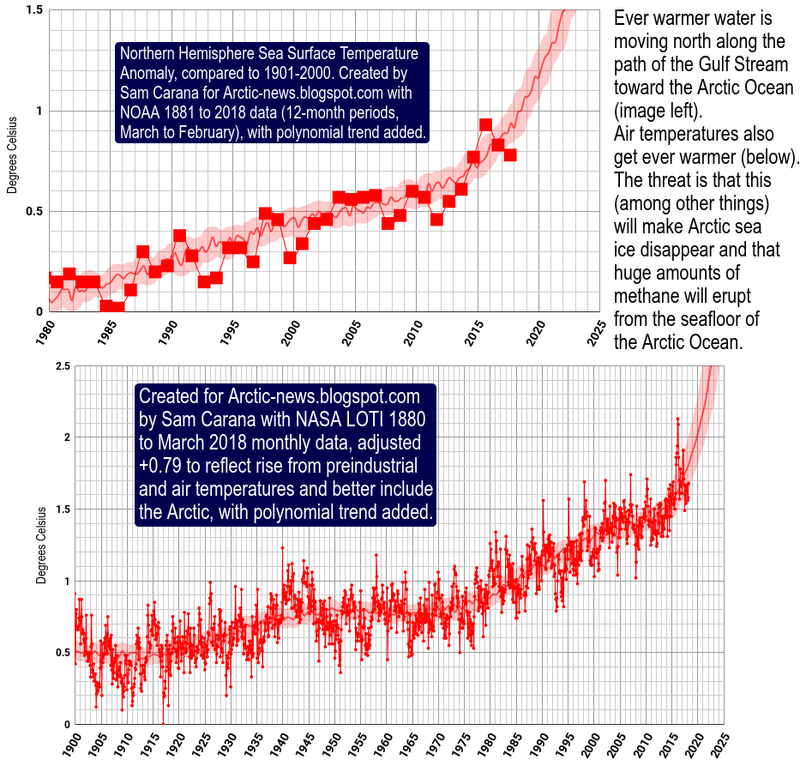 Even worse, a polynomial trendline for the Arctic shows temperature anomalies of 4°C by 2020, 7°C by 2030 and 11°C by 2040, threatening to cause major feedbacks to kick in, including albedo changes and methane releases that will trigger runaway global warming that looks set to eventually catch up with accelerated warming in the Arctic and result in global temperature anomalies of 20°C+ by 2050. To reduce these risks, comprehensive and effective action is needed, such as described at the Climate Plan blog. Methane concentrations in the Arctic are higher than elsewhere in the world, as shown on figure 1. below (NASA image). Methane is entering the atmosphere at high latitudes and spreading across the globe from there. What is causing methane to be released in large quantities in the Arctic? The Gulf Stream, pictured on figure 3. below, is warming up more than usual due to global warming. Specifically, pollution clouds pouring eastwards from the coast of Canada and the United States are the main culprit in heating up the Gulf Stream. In July 2013, water off the coast of North America reached 'Record Warmest' temperatures and proceeded to travel along the Gulf Stream to the Arctic Ocean, where it is now warming up the seabed. 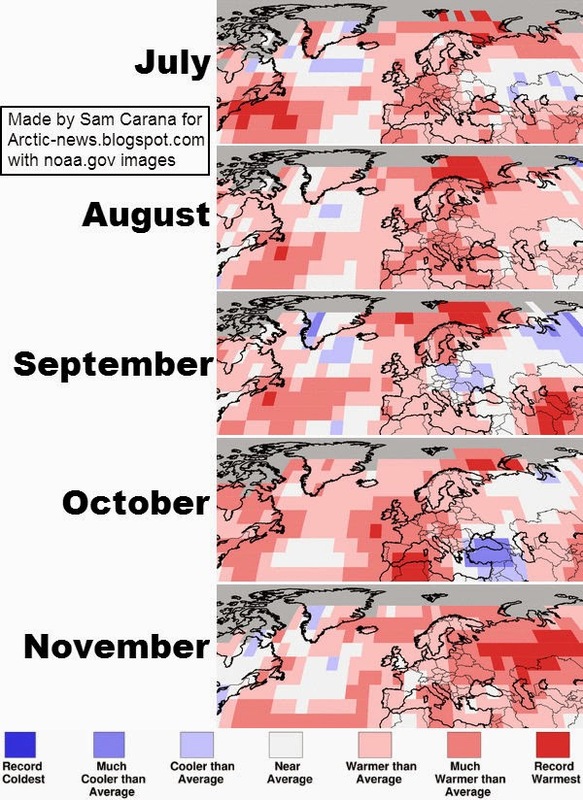 Figure 4. below further shows that above-average temperatures were recorded in July 2013 along the entire path of the Gulf Stream into the Arctic Ocean. 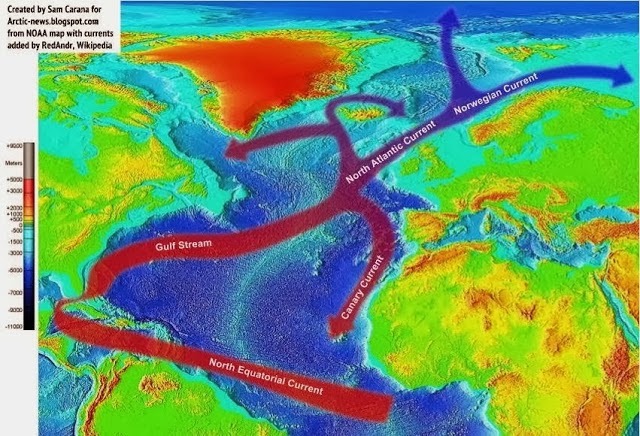 The mean speed of the Gulf Stream is 4 miles per hour (6.4 km/hour or 1.78 metres/second), but the water slows down as it travels north. 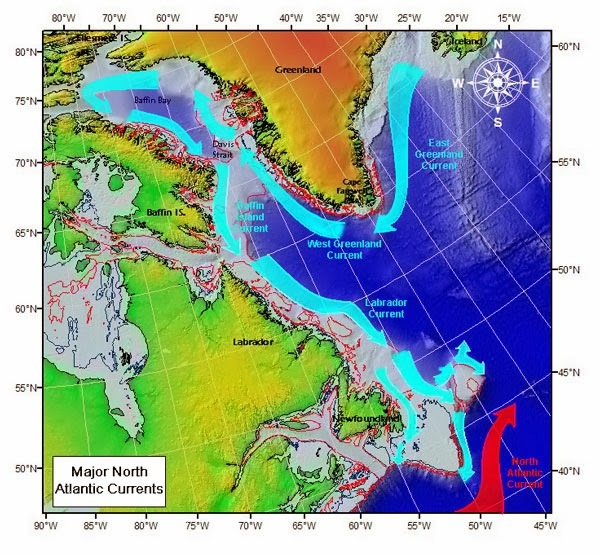 In the much wider North Atlantic Current, which is its north eastern extension, the current flows 3.5 times slower (about 0.51 metres/second), while the West Spitzbergen Current (WSC on figure 5. below) flows at about 0.35 metres/second (5 times slower). The West Spitzbergen Current dives under the Arctic ice pack west of Svalbard, continuing as the Yermak Branch (YB on above map) into the Nansen Basin, while the Norwegian Current runs along the southern continental shelf of the Arctic Ocean, its hottest core zone at 300 metres depth destabilizing the methane hydrates en route to where the Eurasian Basin meets the Laptev Sea, a region of extreme methane hydrate destabilization and methane emissions. Figure 6. below, from an earlier post by Malcolm Light, shows how warm water flows into the Arctic Ocean and warms up methane hydrates and free gas held in sediments under the Arctic Ocean. Sediments underneath the Arctic Ocean hold vast amounts of methane. Just one part of the Arctic Ocean alone, the East Siberian Arctic Shelf (ESAS, see figure 7. below), holds up to 1700 Gt of methane. A sudden release of just 3% of this amount could add over 50 Gt of methane to the atmosphere, and experts consider such an amount to be ready for release at any time. 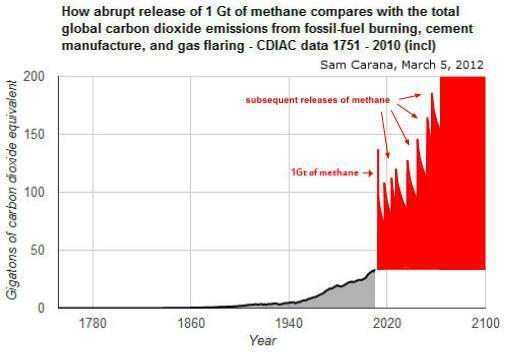 As above figure 7. shows, the total methane burden in the atmosphere now is 5 Gt. The 3 Gt that has been added since the 1750s accounts for almost half of all global warming. The amount of carbon stored in hydrates globally was in 1992 estimated to be 10,000 Gt (USGS), while a more recent estimate gives a figure of 63,400 Gt (Klauda & Sandler, 2005). The ESAS alone holds up to 1700 Gt of methane in the form of methane hydrates and free gas contained in sediments, of which 50 Gt is ready for abrupt release at any time, and Whiteman et al. calculate that an extra 50 Gt of methane would cause $60 trillion in damage. By comparison, the size of the world economy in 2012 was about $70 trillion. Smaller releases of methane in the Arctic come with the same risk; their huge local warming impact threatens to further destabilize sediments under the Arctic Ocean and trigger further methane releases, as illustrated by figure 8. below. 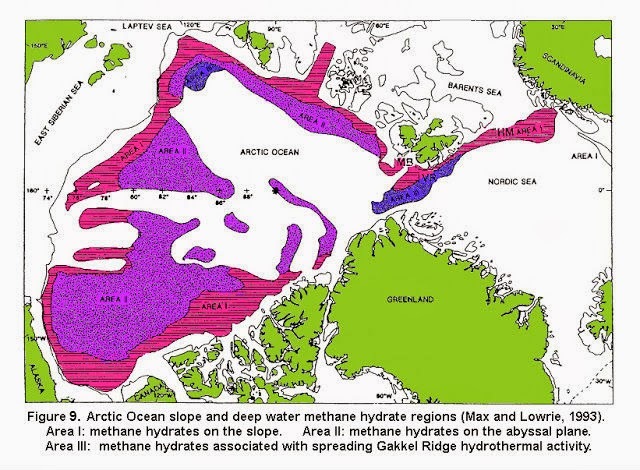 Figure 9. below, from an earlier post by Malcolm Light, shows that, besides the shallow methane hydrate regions in the ESAS, the Arctic Ocean slope and deep water regions contain giant volumes of methane hydrate deposits (methane frozen within the ice). If only a few percent of this methane hydrate becomes destabilized, it will release enough methane into the atmosphere to cause a Permian Age-type massive extinction event. Recent methane emission maps show that, besides the emissions from the ESAS, huge amounts of methane are being released from other parts of the Arctic Ocean. 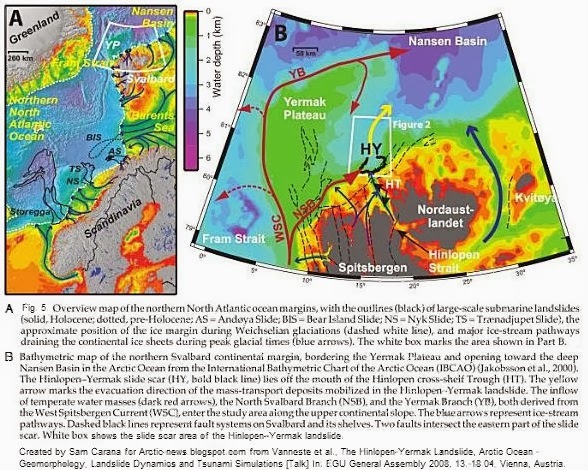 We now know that the subsea methane hydrate is destabilizing at a fast-increasing pace and the pattern of destabilization indicates that it is mainly caused by the increasingly hot "Gulf Stream" waters entering the Arctic west of Svalbard and through the Barents Sea. These "Gulf Stream" waters do a complete circuit in the Arctic, even under a complete floating ice cover, and will destabilize the methane hydrates they come in contact with before making an exit along the edges of Greenland. Methane is now also emerging from the waters of the Greenland coastline, where the southward-bound "Gulf Stream" waters exit the Arctic Ocean along the edges of Greenland. Historically, methane has caused delayed temperature anomalies of some 20°C, according to ice core analysis data, i.e. much higher than anomalies caused by carbon dioxide. Methane has a very high warming potential compared to carbon dioxide. Over a decade, methane's global warming potential is more than 100 times as much as carbon dioxide, while methane's local warming potential can be more than 1000 times as much. As a result, giant zones of circulating warm air in the Arctic have temperature anomalies in excess of 20°C. These hot clouds, resulting from many feedbacks including this Arctic atmospheric methane build-up, show that methane's delayed temperature anomaly of 20°C has already caught up in the Arctic and is going to progressively spread around the world resulting in runaway global warming. Above figure 11. 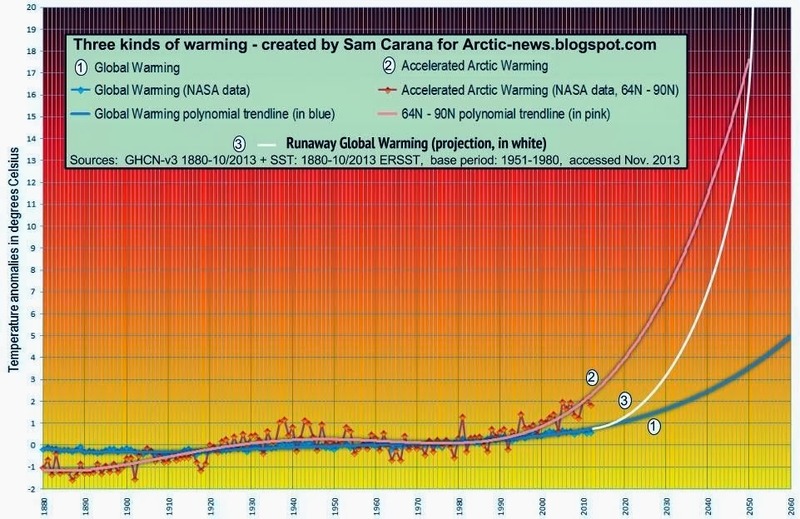 (by Sam Carana) and figure 12. below (by Malcolm Light) indicate that the critical mean atmospheric temperature anomaly of 8°C will be reached between 2035 and 2050. 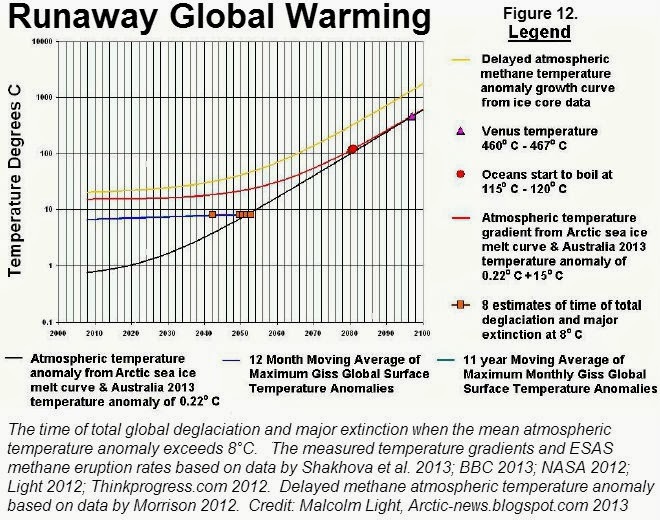 At this temperature we can expect total deglaciation and extinction, according IPCC AR4 (2007). By 2012, the mean atmospheric temperature had increased by some 0.8°C by human induced global warming. This year however Australia has seen an anomalous 0.22°C temperature increase. The new Australian temperature gradient implies that in ten years the atmosphere will be 2.2°C hotter and in 30 to 40 years, 6.6 to 8.8°C hotter which is consistent with the Arctic methane emission temperature increase curves of Carana and Light. The reason for this sudden temperature increase in Australia this year is due to the fast building pall of methane in the Northern Hemisphere caused by global warming and destabilization of the subsea Arctic methane hydrates and the Arctic surface methane hydrate permafrosts. At the moment, the entire Arctic is covered by a widespread methane cloud, but it is very concentrated (> 1950 ppb) over the Eurasian Basin and Laptev Sea where the subsea methane hydrates are being destabilized at increasing rates by heated Atlantic (Gulf Stream) waters. The area of the Eurasian Basin is similar to that of the East Siberian Arctic Shelf (ESAS) where Shakova et al. (1999) have shown that some 50 billion tons of methane could be released at any moment during the next 50 years from destabilization of subsea ESAS methane hydrates. At the moment, water saturated with methane is traveling underneath the ice carried by exit currents and emerging at locations where the sea ice is still less than one meter thick, such as in Baffin Bay and in Hudson Bay, as also shown on the animation below. This massive volume of methane entering the atmosphere will produce catastrophic consequences for the global climate system. Furthermore global warming is now destabilizing methane hydrates in the Eurasian Basin even more than on the ESAS. The release of an additional 50 billion tons of methane or more from the Eurasian Basin over the next 50 years will further compound the catastrophe represented by the destabilization of methane hydrates on the ESAS. 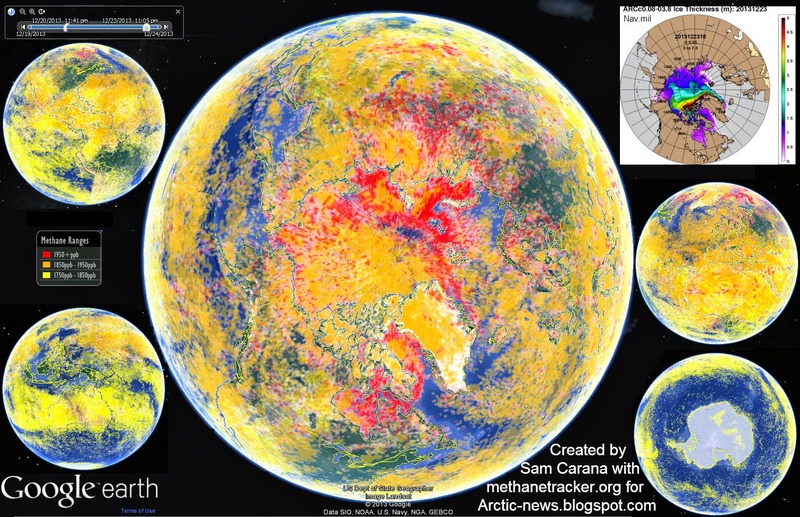 Essentially we have passed the methane hydrate tipping point and are now accelerating into extinction as the methane hydrate "Clathrate Gun" has begun firing increasingly large volleys of methane into the Arctic atmosphere. The growth of the mean atmospheric temperature using the curves on figure 12 indicate that the mean atmospheric temperature anomaly will exceed 1.5°C in 15 years and 2°C in 20 years, at which time storm systems will be very extreme with droughts, flooding, sea level rise and the loss of Pacific islands. When the mean atmospheric temperature anomaly reaches 8°C some 39 years in the future, there will be total deglaciation and a major extinction event that will culminate in a Permian-type extinction of all life on Earth. If we do not stop the massive increases of Arctic methane emissions into the atmosphere the oceans will begin to boil off by 2080, when the mean temperature anomaly exceeds 115 to 120°C and the temperatures will be like those on Venus by 2100 (see figure 12). The present end of the financial crisis and recovery of the U.S. economy will take us down the same fossil fuel driven road to catastrophe that the U.S. has followed before, when they refused to sign the original Kyoto Protocols. Unless the United States and Canada reduce their extreme carbon footprints (per unit population), they will end up being found guilty of ecocide and genocide, as the number of countries destroyed by the catastrophic weather systems continues to increase. The United States and Canada seek to expand their economies by increasingly frenetic extraction of fossil fuels, using the most environmentally destructive methods possible (fracking and shale oil), while the population's total addiction to inefficient gas transport is leading our planet into suicide. We are like maniacal lemmings leaping to their deaths over a global warming cliff. What a final and futile legacy it will be for the leader of the free world to be remembered only in the log of some passing alien ship recording the loss of the Earth’s atmosphere and hydrosphere after 2080 due to human greed and absolute energy ineptitude. The U.S. Government and Canada must ban all environmentally destructive methods of fossil fuel extraction such as fracking, extracting shale oil and coal and widespread construction of the now found to be faulty hydrocarbon pipeline systems. All Federal Government subsidies to fossil fuel corporations, for fossil fuel discovery and extraction must be immediately eliminated and the money spent solely on renewable energy development, which will provide many jobs to the unemployed. All long and short range (high consumption) fossil fuel-powered transport must be electrified or converted to hydrogen and where the range is too large, electric vehicles (including electric trains and ships) must be used instead of fossil fuel-powered trucks or aviation means of transport. All the major work for this conversion (including railway construction) can provide a new and growing set of jobs for the unemployed. Nuclear power stations must continue to be used and should be converted to the safe thorium energy system until the transition is complete. The U.S. has to put itself on a war footing, but rather than fighting other military forces, it should recall its military forces from various places across the world and set them to work on the massive shift to renewable energy that the country needs to undertake if it wishes to survive the fast approaching catastrophe. The threat now comes from Mother Nature, who has infinite power at her disposal and intends to take no prisoners when she will strike back hard over a very short, absolutely brutal, 30-to-40-year period which has already begun. I cannot emphasise more, how serious humanity’s predicament is and what we should try to do to prevent our certain final destruction and extinction in 30 to 40 years if we continue down the present path we are following. Above action plan (figure 14.) includes efforts to move to a sustainable economy (part 1.) and efforts to reflect and divert heat away from the Arctic (part 2.). 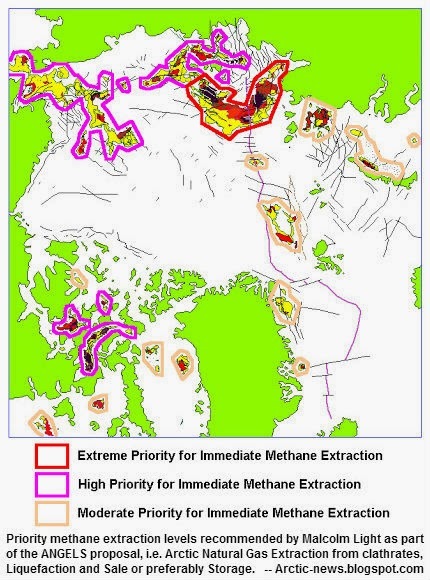 Furthermore, it includes action on methane escaping from hydrates in the Arctic (part 3. ), as described at the Arctic methane management page. Two types of methane management are further discussed below. In the ANGELS Proposal, subsea Arctic methane is extracted, stored and sold as LNG for distribution as fuel, to produce fertilizer, etc. Permanent storage underground, however, is more preferable. 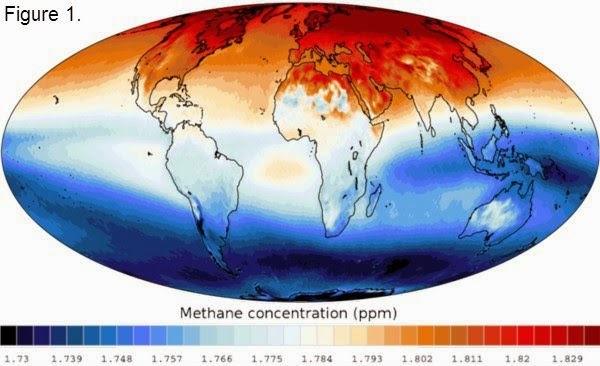 As described by Sam Carana in an earlier post, Prof. Kenneth Yanda, at the University of California, Irvine, has shown that methane can be stored in propane - methane hydrates that are stable at temperatures of ca 15°C and low pressure (25 pounds per square inch - 1.66 atmospheres), very close to the ambient temperature and pressure conditions. 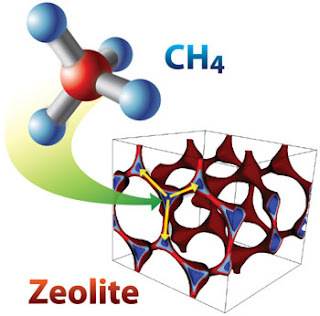 Hydrates can be produced that contain larger cages for other gases and smaller cages for methane. 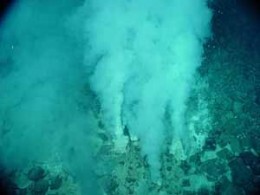 Methane can be converted into propane and other gases with UV light and the final goal would be long-term storage of these gases in the form of hydrates in deep waters such as those north of Alaska, suggests Sam Carana, adding that carbon dioxide can also then be sequestered in the hydrates, after its removal from the atmosphere. Unlike carbon dioxide, methane is completely non-polar and reacts very weakly with most materials. Three zeolite types (SBN, ZON and FER) have been found to absorb methane at high to moderate rates (Figure 17, from Lawrence Livermore National Laboratory (LLNL) and UC Berkley, 2013). These materials can help limit escape of fugutive gases from extraction, transport and distribution of methane. The Lucy project seeks to decompose methane in the atmosphere. In a new modified version of the Lucy Project, hydroxyls can also be generated by a polarized 13.56 MHZ beam intersecting the sea surface over the region where a massive methane torch (plume) is entering the atmosphere, so that the additional hydroxyl will react with the rising methane breaking a large part of it down. The polarized 13.56 MHZ radio waves will decompose atmospheric humidity, mist, fog, ocean spray, and the surface of the waves themselves in the Arctic Ocean into nascent hydrogen and hydroxyl (figure 18). The newly determined atmospheric temperature gradient indicates that the mean global atmospheric temperature will reach 1.5°C in 15 years and 2°C in 20 years (Figure 14). 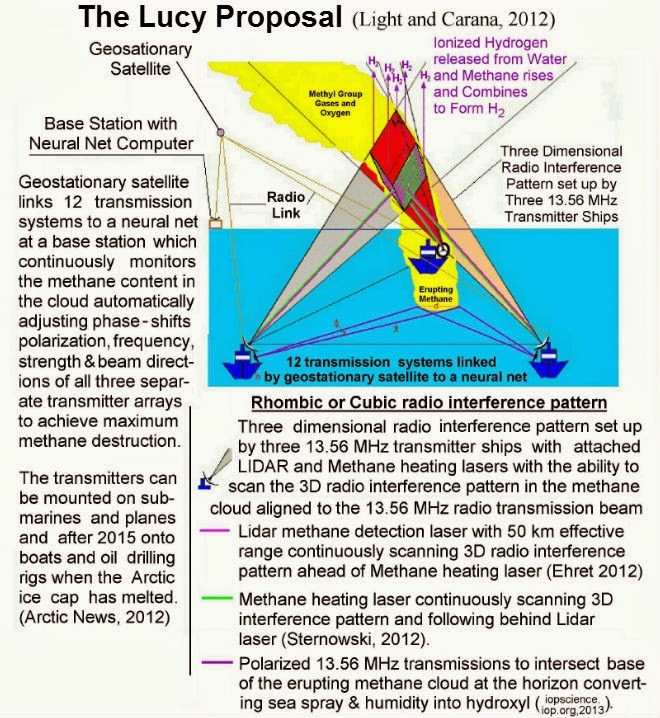 Consequently we only have 15 years to get an efficient methane destruction radio - laser system designed, tested and installed (Lucy and Alamo (HAARP) Projects, figure 18) before the accelerating methane eruptions take us into uncontrollable runaway global warming. This will give a leeway of 5 years before the critical 2°C temperature anomaly will have been exceeded and we will be looking at catastrophic storm systems, a fast rate of sea level rise and coastal zone flooding with its extremely deleterious effects on world populations and global stability. The Greenhouse Gases that human civilisation has emitted have warmed the Arctic more than any other area on Earth. The reasons for this are well known and will not be repeated here. This has resulted in a loss of sea ice especially in the late summer. More recently still Methane has started to be released from Methane Hydrates especially from the East Siberian Arctic Shelf (ESAS). Emissions of Methane from this area increased from 8 to 17 Tg (teragrams or megaton) between 2009 and 2012 according to research done by Natalia Shakhova and in 2013 appear to be about 22 Tg. My understanding is that the climate research organisations broadly accept that Methane emissions from the ESAS have risen substantially in the last few years, as indicated above, and are a serious concern, but they are still small compared to total global emissions of Methane and they do not accept that they will runaway in the near future. This needs examination. The warming of the Arctic seems likely to lead to the total melting of the Arctic Sea Ice in late summer no later than the summer of 2018 and to massive release of Methane from the melting of Methane Hydrates beneath the ESAS by the same date leading to runaway Global Warming and the end of most life on earth. 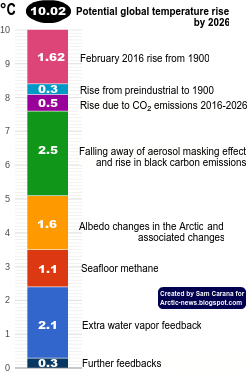 In 2018, and probably before, the Arctic will be much warmer and the rate of Methane emissions by 2016 will cause alarm worldwide. In 2016 it will probably no longer be possible to prevent a runaway greenhouse event. The problem is that until after a runaway event has started, drastic climate impacts will not occur, so most people will not be alarmed by the situation. Nonetheless, immediate action is essential to cool the arctic. The reason for this is that the ice is melting earlier in summer than has been the case for several millennia, because of Arctic Warming caused by the increased concentration of Greenhouse Gases in the atmosphere. Methane is still being released in relatively small quantities from Methane Hydrates beneath the ESAS now, but this will accelerate rapidly as Methane concentrations increase in the arctic atmosphere, since they will absorb more sunlight and warm the Arctic, causing further Methane releases. 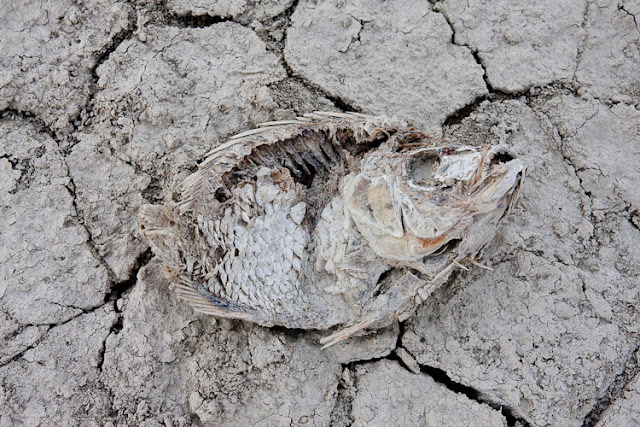 Humanity may be able to prevent this from occurring, if drastic action is taken almost immediately, but if we don’t react then this will very rapidly become a runaway Greenhouse Event and out of our control. We must drastically reduce Greenhouse Gas emissions and take action to cool the arctic. It is essential that your government responds to this emergency by publicising this worldwide and by trying to obtain a global agreement to drastically reduce global Greenhouse Gas emissions and to cool the Arctic. N.B. The truth of this prognosis should rapidly become apparent by measuring Methane emissions and concentration in the Arctic atmosphere in 2014. Thus very closely measuring arctic Methane emissions and atmospheric concentration is essential in 2014 and thereafter. If you like to add your name added in support for this statement, please comment at the facebook post below. As the year draws to a close, it's time to review where warming has occured most strongly in 2013. 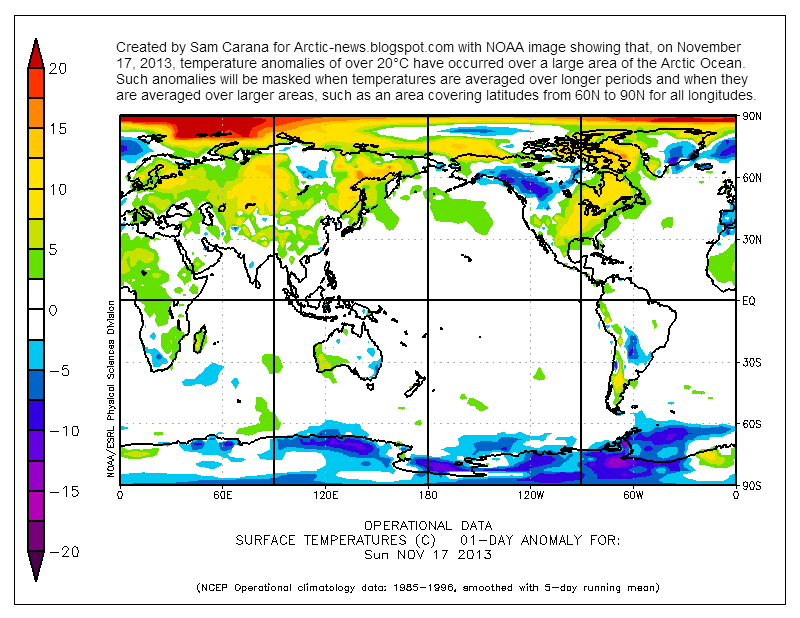 Surface temperature anomalies in November 2013 were 0.77°C, the highest global November anomalies on record. 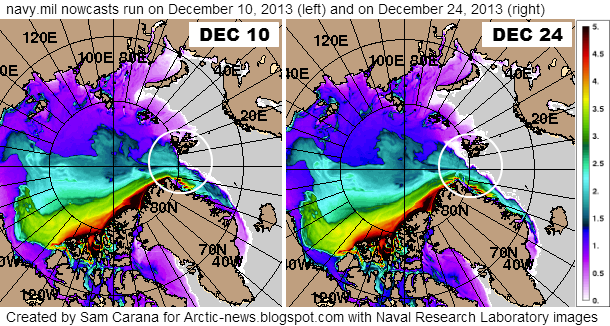 In November 2013, high temperature anomalies occurred in the Arctic, well over 9°C north and south of Novaya Zemlya. A new study by British and Canadian researchers shows that the global temperature rise of the past 15 years has been greatly underestimated. The reason is the data gaps in the weather station network, especially in the Arctic. If you fill these data gaps using satellite measurements, the warming trend is more than doubled in the widely used HadCRUT4 data. Where did warming occur most strongly in 2013? The red/orange areas on the image below shows surface temperature anomalies of more than 2°C for the year from December 13, 2012, to December 12, 2012. As the image shows, temperature anomalies have hit Earth most strongly in the cryosphere, i.e. - in the Arctic, as discussed below. Over the past 90 days, the Arctic Ocean has shown surface temperature anomalies of over 5°C and in some spots over 8°C. Looking at anomalies over longer periods can mask the occurrence of much higher anomalies on individual days. As an example, temperature anomalies of over 20°C were recorded over a large part of the Arctic Ocean on November 17, 2013. Baffin Bay, west of Greenland, has until now received little attention. 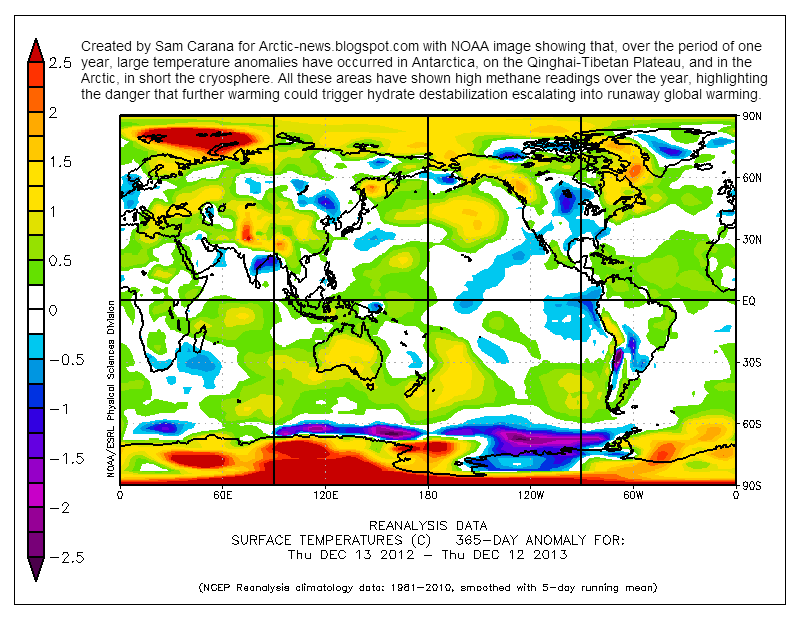 High temperature anomalies over the past year show up on the top image. These high temperatures are the more striking given that a cold sea current runs through Baffin Bay, as shown on the image below. Methane has emerged strongly from areas that have warmed most in 2013. In August 2013, high concentrations of methane showed up over Siberia. High methane releases have further occurred in all three parts of the cryosphere mentioned above, i.e. from the heights of Antarctica, as discussed at this post, on the Qinghai-Tibetan Plateau, as earlier discussed at this post, and in the Arctic, as discussed in many posts at the Arctic-news blog. 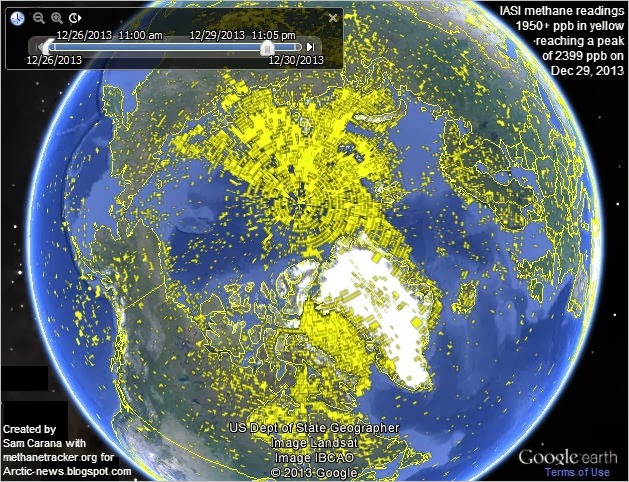 Huge methane concentrations have featured over Baffin Bay recently. 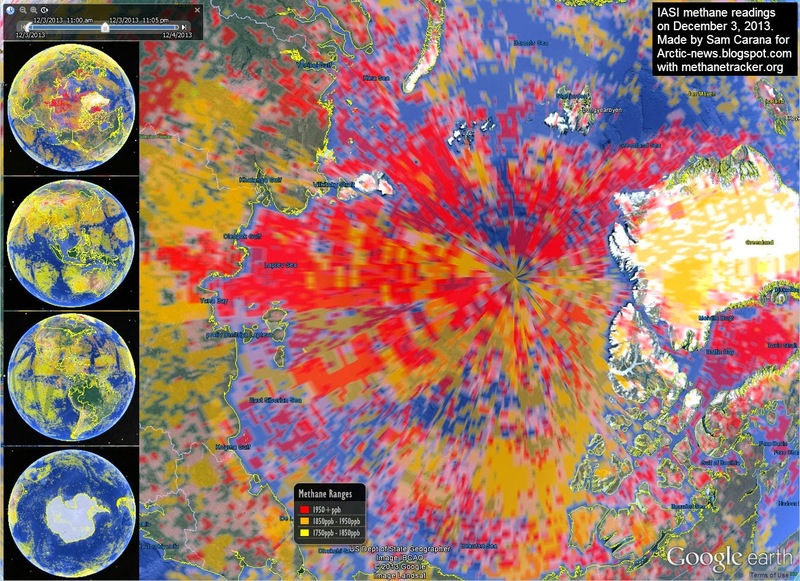 The animation below shows huge methane emissions emerging from Baffin Bay on December 1-2, 2013. The power behind these methane releases is strong enough to make it difficult for thicker ice to form in Baffin Bay. 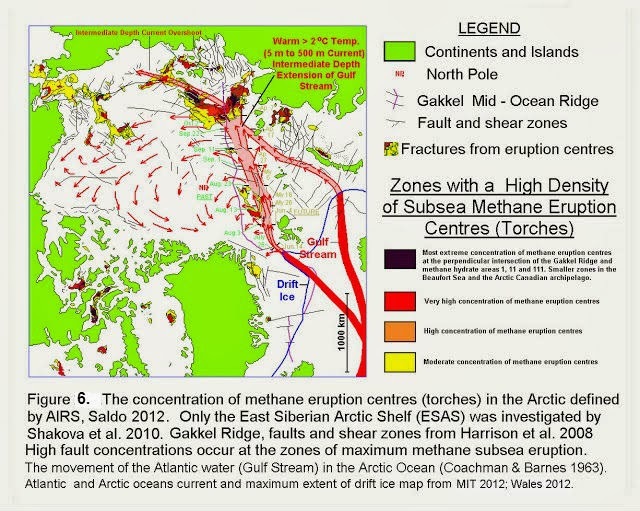 The animation below shows an area marked by a red rectangle where it looks like the water would have been covered with thicker ice, had there not been so much methane bubbling up in the area. This area with very thin ice in Baffin Bay is further illustrated in the Naval Research Laboratory 30-day Arctic sea ice thickness animation below. This constitues yet another feedback, i.e. methane bubbling up from the seafloor of the Arctic Ocean with a force strong enough to prevent sea ice from forming in the area. "Across two decades and thousands of pages of reports, the world's most authoritative voice on climate science has consistently understated the rate and intensity of climate change and the danger those impacts represent, say a growing number of studies ....... The speed and ferocity of climate change are outpacing IPCC projections on many fronts, including CO2 emissions, temperature rise, continental ice-sheet melt, Arctic sea ice decline, and sea level rise. The IPCC’s overly conservative reading of the science ..... means governments and the public could be blindsided by the rapid onset of the flooding, extreme storms, drought, and other impacts associated with catastrophic global warming." This massive failure by IPCC means that governments world-wide have not been given adequate warning about how preciously little time may be left to prevent the crossing of a tipping point leading to unstoppable global catastrophe. By not addressing the unique consequences brought on by accelerated Arctic warming, the IPCC is in fact skewing the picture that needs to be presented. Even worse, more cutting edge science (also not included in the IPCC report) reveals additional unsettling developments. Exposure to sunlight appears to speed up the rate of permafrost thaw: "...sunlight increases bacterial conversion of exposed soil carbon into carbon dioxide gas by at least 40 percent compared to carbon that remains in the dark." This thaw on land is being matched in the shallow coastal seabeds. Natalia Shakhova - who has helped lead numerous fact-finding missions along the coast of Siberia - reports that releases there are "now on par with the methane being released from the arctic tundra." She also warns that these releases can be larger and more abrupt than those resulting from decomposition on land. As previously frozen methane vents to the atmosphere, the warming it causes can thaw and release even more. This "feedback" is capable of escalating into a "runaway" chain reaction that humanity would be helpless to stop. This is the same methane that some scientists point to as a major factor in the most sweeping mass extinctions in earth's history - the PETM and the end-Permian, the latter of which decimated 90 percent of all life forms. Whether this association can be absolutely proven or not (the scientific basis for its connection to the Permian is explored in the BBC documentary "The Day Earth Nearly Died"  ), no one can credibly deny the immense power of this greenhouse gas. By omitting this crucial information, policymakers are being dangerously lulled into believing there is more time to act - and less urgency - than what is in fact the case. At precisely the moment when the world needs the most unambiguous and emphatic warning from the scientific community - a moment which may not afford humanity any second chance to recover and correct course - it is nowhere to be found. Originally created with a mission to provide government bodies with un-biased scientific facts on climate disruption in order to inform the process of policymaking, the IPCC process has become seriously impaired by a combination of internal problems and outside pressure. The result has been the production of reports that not only fail to keep up with the cutting edge of the science itself but are also tainted by a bias toward overly conservative assessments. Materials from scientists are only accepted for consideration after they have been peer-reviewed and published in a scientific journal. This process in itself can take up to three years. Then another requirement is that such materials cannot be submitted beyond an early cut-off date. The goal of instituting an orderly process is laudable, but the severe problem is that the pace of climate disruption is most assuredly accelerating. If vital information at the cutting edge of these frightening changes cannot make it through these hurdles in time, there is a huge gap of five or six years before it can be integrated into the next report. A key example would be the definitive paper documenting the land-based permafrost feedbacks which asks IPCC to issue a special assessment. Not only was this request ignored, but this documentation was not even considered as it was published after the cut-off date. The current IPCC report is quite intimidating at over 2000 pages long. A solution to both problems of timeliness and excessive length is to make the IPCC process more nimble by tackling the various key components of climate disruption individually rather than combining them all into one ponderous document. An example would be a report strictly limited to Arctic issues. As the most rapidly warming region on earth - with profound impact on the global climate - it is entirely deserving of special attention. This provision should be put up for debate and stricken. There is a corrective action which can be taken. Precedent already exists for the IPCC issuing a "Special Report" on aspects of the issue it considers worthy of special attention. A recent example is one on the increasing frequency of extreme weather events. There is a powerful case behind the need to release a Special Report on the threat from permafrost thaw in the Arctic. But an institution this size does not move unless there is a strong and coordinated campaign aimed at raising the issue and applying some "push". All the grassroots environmental groups that have led the climate movement are now called to recognize the dire need to integrate this frightening issue into the framework of all thinking and strategizing. If this is not done, and governments around the world continue to ignore it, there is a high likelihood that all other climate campaigns will fail. 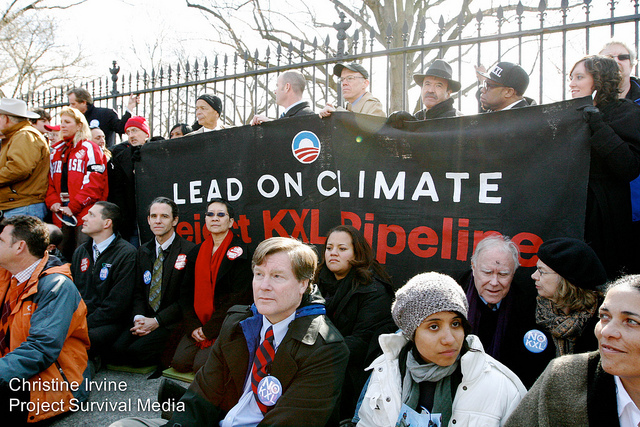 The valiant effort to oppose the tar sands pipeline must be continued. But this movement must recognize that the climate threats are not presenting themselves in single file - one at a time. Several dangers are simultaneously bearing down on humanity. The laws of physics driving these threats will not pause for political stagnation. If the governments of the world fail to see the sleeping giant awakening in the Arctic and adjust their collective sense of urgency accordingly, then it appears our fate is sealed. The laws of physics will run their course. We owe it to those generations that would inherit a devastated planet to do better than that. The prospect of humanity being blindsided by a tremendous - and perhaps even fatal - blow is unthinkable. There is no "Planet B" to turn to if the conditions necessary to support life on our present planet are wiped out. Our society places great trust in the scientific community. Faced by any threat of this magnitude, our assumption is that our scientists will fulfill their moral obligation, act on the precautionary principle, and give us ample warning. In this case, that trust is being violated. It is therefore up to concerned citizens everywhere to speak out, hold them accountable, and insist that governments receive the warning that is needed. This dangerous and potentially suicidal omission must not be allowed to stand.